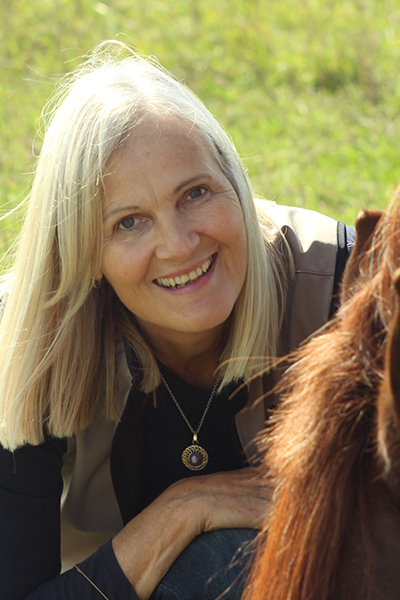 Two streams of purpose and passion have always flowed through Kerstin’s life: a deep love for horses and a passionate interest in the transformation of consciousness – her own as well as others’. As a very young child living in the city, Kerstin rode a broomstick horse wearing a handmade riding outfit, dreaming horses into her life. It worked! At the age of 12, Kerstin started riding lessons. Being involved with horses helped her navigate through her teenage years to adulthood. Several years later, exposure to natural horsemanship showed Kerstin how to connect on a deeper level with horses and she was hungry for more. She had gotten a taste of the transformational potential of being and working with equines. Kerstin hooked up with the horses and people at PRANCE, a therapeutic equestrian centre in Saugeen Shores, Ontario. She volunteers with the therapeutic riding program as well as at the board level of the charity. But the real possibility of an even deeper connection with the horses became clear when Kerstin got inspired by Linda Kohanov’s book ‘The Tao of Equus’. It was like stepping into a different universe; a new dimension opened up and Kerstin realized that this was the fusion of her two streams of passion. In pursuit of deepening her knowledge of equine experiential work, Kerstin took courses with EFW-CAN (Equine Facilitated Wellness-Canada). She continued to read Linda Kohanov’s books and took the ‘Power of the Herd’ course at Linda’s farm in Arizona. Linda Kohanov was one of the first people in North America to help the broader public glean an insight into the potential of this work. Kerstin’s zest for continued learning in this field has taken her to Horse Spirit Connections where she graduated as a certified FEEL practitioner in Oct 2018. She credits Horse Spirit Connections for giving her deep spiritual insights and a very practical approach with this work. Kerstin feels that we are past the era where we were either spiritual people, praying and meditating all day or where we were worldly people, making a living and raising a family. She feels that these are the times to ground the spiritual energy on the planet while living our worldly lives. At Horse Spirit Connections a deeper awakening to this understanding took place for Kerstin, a deeper seeing that the horses are embodying this wisdom and are teaching us how to meld these two worlds. Let’s go back in time to learn about the other stream weaving itself through Kerstin’s life. At the age of 17, her mother invited Kerstin to a self-awareness seminar which started a life long passion for delving deeper into the mysteries of life and ultimately led her to pursue training and personal transformation with O&O Academy in southern India and North America. O&O Academy is an international philosophy and meditation school with the sole purpose of transforming human consciousness. Kerstin is a ‘One Consciousness Transformer’ offering ‘The Beautiful State’ workshop in Canada. Kerstin’s professional career in the nuclear industry required her to always ‘hold’ the bigger picture while doing detailed, focused work; an excellent skill to have for equine facilitated work where the facilitator holds the ‘container’ of the session while focusing on client and horse. She also learned to have a healthy respect for safety. Working with many people from all walks of life in a supervisory position, be it in her professional life or in her former role as a co-owner of a restaurant/gift store, has given Kerstin an opportunity to develop people skills and an ability to work with what presents itself at the moment. Her equine facilitation training, as well as life lessons, personal growth through spiritual pursuits and a beginner’s mindset, allow Kerstin to create a safe and sacred space of possibilities for her sessions. While partnering with savvy equines, Kerstin loves to help people grow and become more self-aware and present. She loves to see her clients be inspired by their connection with the horses, from which comes emotional clearing, more clarity for life pursuits as well as increased confidence and happiness. Kerstin invites you to experience transformational work with her and the horses in Saugeen Shores, Ontario. For more info and/or to book a session, please contact her at essmann@bmts.com.